It's Not Work, It's Gardening! : Lightning! We had some thunderstorms move through the St. Louis area last night just as it was getting dark. At first the storm clouds were reflecting the rays of the setting sun, causing them to be a strange yellowish-orange color overhead as the rain poured down (sorry, no photos). Several minutes later when it was darker the lightning started. We get thunderstorms quite regularly here, and although this wasn't a system that was strong enough to spawn tornadoes, dump loads of hail, or have frightening winds (at least around us -- perhaps it was worse in other parts of the city?) one thing it did have was lightning. An amazing amount of lightning. After the storm passed us to the east I went out onto the deck and shot some video. You can hear a few raindrops falling and a bit of thunder, but I'm glad that most of the lightning was in the clouds and wasn't producing thunder (or was it?) -- it would have been deafening! If you live someplace where thunderstorms aren't too common, I hope you understand that sometimes they can put on quite a show! For some of my older posts about storms, take a look here, or maybe here for my favorite storm photos. Wow, that's quite a thunderstorm! I've seen a little bit like that south of here, but not that close. That's a lot of thunder! 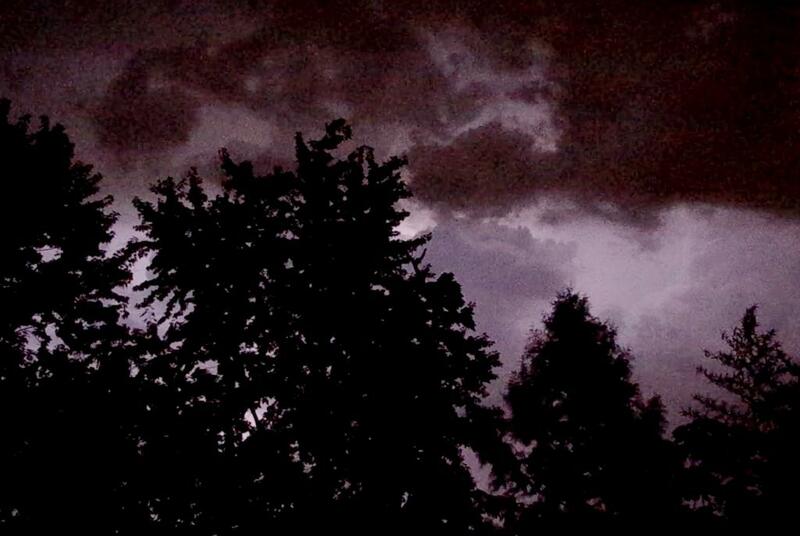 We seldom get thunder here and certainly nothing like your show. Amazing! Thanks for the video! Quite a dramatic show that is, cool!! I would have loved to see that. We get lightning so rarely that it's an event when it happens!